Wearing braces is often looked at as an inconvenience and a frustration, but in all the years to come you’ll be so glad that you went through a little bit of annoyance to end up with wonderful teeth! 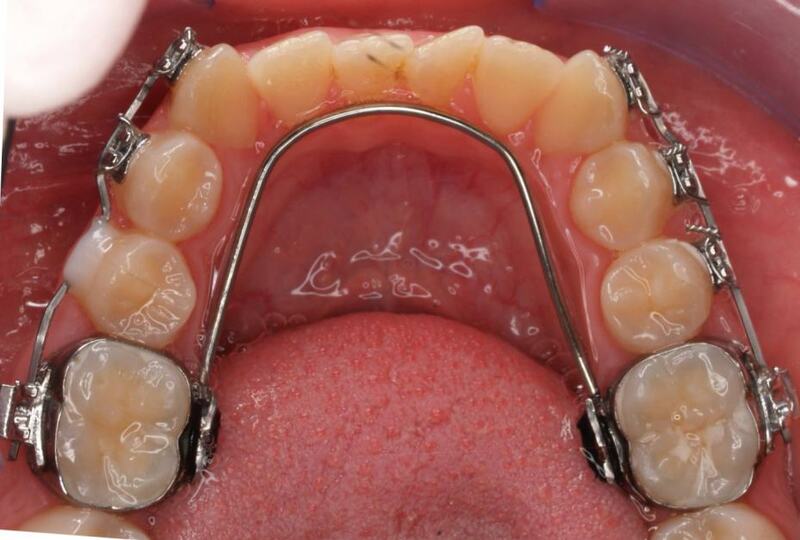 Many people worry that cleaning teeth with braces is impossible. But that isn’t true! Keeping your teeth clean is very possible; it just takes a different style of brushing. Once you’re used to brushing your teeth in a different manner, you’ll soon wonder what you were worried about. It’s incredibly easy when you know how, and that’s what we want to teach you with this article! When you wear braces it’s easy for bits of food to get stuck under or between the braces, and if this food is left then plaque can feed off it and start to cause tooth decay or disease. Because brushing your teeth feels more difficult at first, many people fall into the habit of not brushing properly – this is the worst thing that you can do. Keeping your teeth clean and paying special attention to your dental hygiene while you’re wearing braces is hugely important, and your teeth will thank you for it in the long run! Your orthodontist and your dentist will also be able to advise you on their recommendations for you – everybody’s mouth is different, and they will know what’s best for you. When you first get your braces fitted, your orthodontist will give you clear instructions on how to look after your teeth and how to clean them. This guide is intended to expand on that advice, and help you keep your teeth as sparkling and clean as possible, even when you’re wearing braces! Before you start to brush your teeth, rinse your mouth out with either mouthwash or salt water. Many dentists and orthodontists will recommend rinsing your mouth with salt water every day after you’ve first had your braces fitted to prevent any infection, but there is nothing to stop you doing this every day. Rinsing your mouth helps to release slightly larger particles of food that are trapped under your braces or between your teeth. Once you’ve rinsed your mouth out, you can start to brush your teeth. Start off with the insides of your teeth – where you don’t have braces – and work on cleaning these thoroughly. Clean the tops of your teeth too – the areas that bite together when you’re chewing – and ensure you’ve cleaned them as well as you can. Now it’s time to focus on the front of your teeth, where your braces are. If you’re using an electric toothbrush, then it’s time to turn it off so the bristles aren’t rotating – there is more information about this further on in this article. Whether you’re using a manual or an electric toothbrush, now is the time you want to be as careful as possible. You don’t want to get the bristles of your toothbrush stuck in your braces, so brush gently and softly – many people find that using a mirror helps. Brush around the braces, but be sure to also brush the braces themselves using small, circular motions. If you do get the bristles stuck, don’t panic – and certainly don’t try to rip the toothbrush out of your mouth. Instead, slowly and carefully untangle the bristles from your braces the best that you can without damaging your braces. After you’ve brushed with your regular toothbrush, it’s time to either floss or use an interdental toothbrush. Many people with braces prefer to use an interdental toothbrush as it’s incredibly easy to get dental floss caught in your braces, and this can be hugely frustrating! 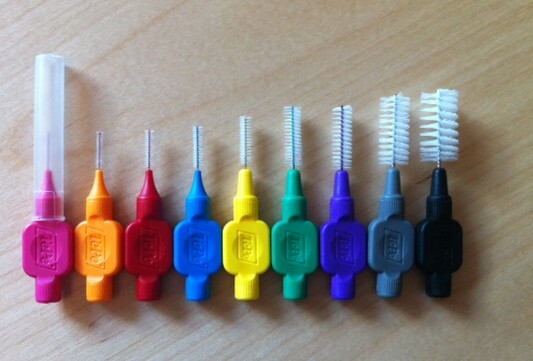 Whichever one you decide to use, make sure you brush in between every tooth. When using an interdental toothbrush, clean any holes in your braces with this too. After you’ve finished brushing your teeth, it’s never a bad idea to rinse your mouth out again – either with mouthwash, normal water or salt water. This will help to capture any bits of food or plaque that have become loose during your brushing process, and rinsing will enable you to get rid of these! The main thing to keep in mind during the whole brushing process is to pay equal attention to each tooth, and to really focus on staying calm and taking your time, and finding a method that works best for you. Dentists advise that you should brush your teeth at least twice a day. This is the advice given for people both with and without braces. Brushing your teeth in the morning and at night helps to keep your teeth and gums as healthy as possible. However, when you’ve got braces, there are many more places for small pieces of food to get stuck. To make sure that you’re keeping high standards of dental hygiene, it’s advisable to brush your teeth more often when you’ve got braces. Ideally, if you can brush your teeth after each meal that would be wonderful for your teeth! This isn’t often practical, but people have many ways of dealing with this. Carrying a travel toothbrush or an inter-dental toothbrush is the best solution for a lot of people. If this doesn’t work for you and you don’t have the chance to brush your teeth after each meal, then at least rinse your mouth out with either mouthwash or water after each meal. This will help dislodge any small pieces of food that are stuck in your braces or between your teeth, and will keep your mouth healthy. I Can Feel Teeth Moving With My Braces – Is This Normal? When people first get braces fitted, one of the most common reasons for them to panic is because they can feel their teeth moving with their braces. Don’t worry! This is totally normal – especially in the first few days of having your new braces. 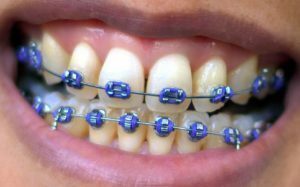 The braces are causing your teeth to shift slightly – which is the aim of having the braces – but this is very strange to experience if you’ve not felt this before. 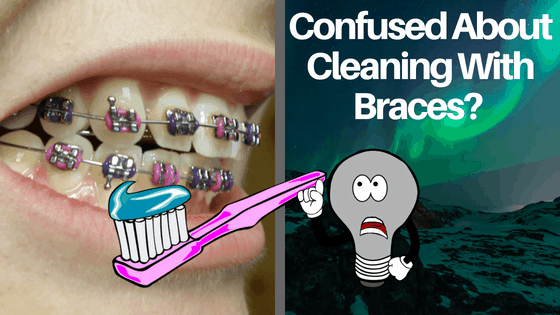 People notice different things when they first have braces fitted – sometimes teeth can feel super loose, and a lot of the time when you’re brushing your teeth you will be able to feel the teeth moving a tiny bit. You may also notice gaps between your teeth in places that you hadn’t noticed them before. This can be incredibly scary if you weren’t expecting it or don’t know whether it’s normal or not, but you don’t have to let it scare you. If the tooth feels so loose that you think it’s going to fall out and it’s causing you sleepless nights, then make an appointment to see your osteopath or your dentist to talk to them about it. However, if the teeth are only moving a small amount and you’re not experiencing unbearable tooth pain or discomfort, then you can relax in the knowledge that a slight amount of movement is totally normal when you have braces fitted. With all these kinds of issues, you know yourself, your pain threshold and what you’re used to – if you are feeling as though something is badly wrong, then don’t be afraid to make an appointment with somebody you trust. However, do bear in mind that your teeth are unbelievably strong- they have to be, simply to chew food – and they’re a lot more resilient that we often think! Just because they’re moving a tiny amount when you brush them doesn’t mean they’re about to fall out – so you can rest easy about that fear. How Do I Brush With An Electric Toothbrush If I Have Braces? Many dentists recommend an electric toothbrush over a non-electric toothbrush, because they help to get a deeper, more thorough clean. However, many people are wary about brushing teeth with braces on with an electric toothbrush – but there’s no need to worry! If you take a few steps to be careful of your braces, there’s no problem at all using an electric toothbrush. Start off by using either mouthwash or water and swilling it around your mouth to dislodge any larger pieces of food that may have become caught in your braces. Once you’ve done this, brush the tops and backs of your teeth as you normally would with your electric toothbrush. Take care not to brush the braces at this point. When you’ve cleaned the back and top of your teeth, turn your electric toothbrush off to clean the front of your teeth and your braces. You don’t want the bristles to get stuck in your braces because they’re rotating fast! Gently clean your braces with your electric toothbrush while making sure the bristles aren’t moving, and take care not to brush too hard – you don’t want to end up damaging your braces. 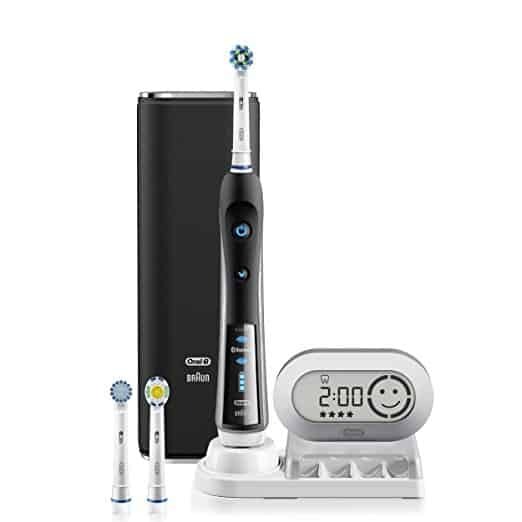 If your kid has recently got braces then you might want to to take a look at the Best Electric Toothbrush For Kids WIth Braces post we wrote last year. Everybody’s teeth are different, and different styles of brush are better for different people. Some people brush too hard and damage their gums if they’ve not got a super soft toothbrush, while other people don’t brush hard enough and need one with harder bristles. However, there are some that are recommended by dentists in 2018, and here we’ve compared the best manual toothbrush and the best electric toothbrush. 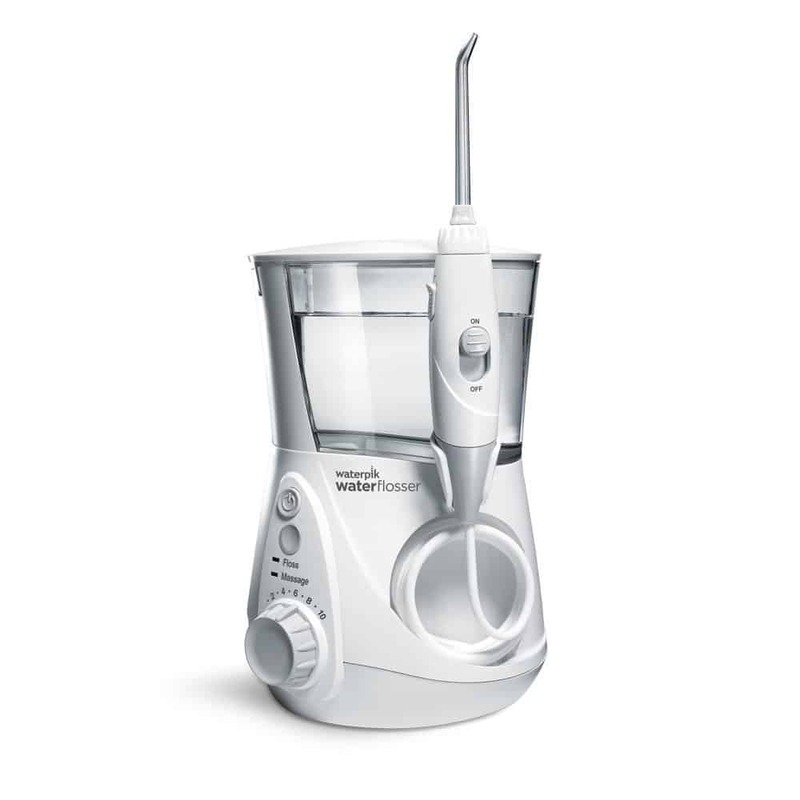 The best electric toothbrush on the market for people with braces at the moment is the Philips Sonicare 2 Series. It’s been designed to clean 6 times more plaque than manual brushes, and it’s been designed to not have super straight bristles. It has bristles that are curved, and those people who have created it claim that the bristles perfectly match the shape of teeth. This helps you to keep your braces super clean, and the more plaque you can get off your teeth when you’re brushing them yourself at home, the better! 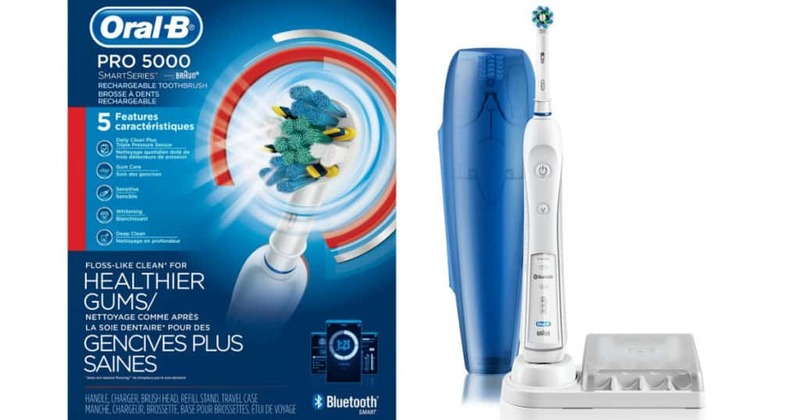 While electric toothbrushes are great, some people don’t like using them and for others they’re not affordable – if you’re on a budget, then it’s not necessarily going to be possible for you to spend a lot of money on an electric toothbrush. 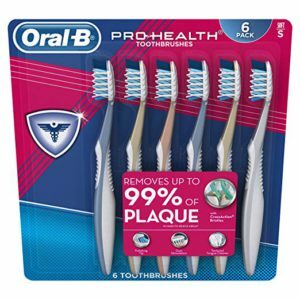 There are some incredible manual toothbrushes out there too – and the best one at the moment is the Oral-B Pro Health toothbrush. Oral-B have really gone outside the box with this design – they’ve created bristles that criss-cross one another, which means that the bristles are getting behind the braces from both angles to give a much deeper and more efficient clean than a normal manual toothbrush. There are certain instances where your dentist or orthodontist would recommend something very specific to you – before buying a new toothbrush, it’s always worth speaking to them about what they think the best option for you will be. Lifestyle is important to consider too – if you travel a lot for work or pleasure, it may be harder to carry an electric toothbrush with you – again, your dentist will be able to recommend alternatives or travel products that will make your life easier. Flossing is a hugely important aspect of dental health. Flossing helps to prevent small bits of food or plaque that are trapped in between your teeth staying trapped and causing problems. If food particles or plaque stay between the teeth, it will build up over time and can cause gum disease, decay and infection. However, flossing when you have braces can be hugely frustrating if you’re not used to it, as it’s tricky to work around your braces while you’re flossing. The trick here is to take your time – don’t try to do it in a rush as you’re more likely to go wrong. Using a mirror to help you avoid getting the floss caught in your braces is a great idea. Many people find that this helps them to floss much more easily, as you can see what you’re doing and take the necessary care. This is also a good idea as while you watch yourself, you can see if there are any areas of your mouth that you’re accidentally missing or not giving as much attention to. Make sure that you don’t catch the floss on your braces – if you do, then don’t pull the floss hard to get it loose! If you do, you run the risk of snapping or breaking part of you braces. If you do get the floss caught, then untangle it incredibly gently. Using an interdental toothbrush gets rid of the risk of catching floss in your braces – these are also incredibly good at removing plaque and food from between teeth. They come in different sizes, so you can find one that works for you. Talk to your dentist about the best options for you, and if you’re unhappy with what you’re using then don’t be afraid to try something new. Is Going To The Dentist Regularly For More Thorough Clean Necessary? Normally, depending on the condition of your teeth, the dentist will want you to visit every 6-12 months for a thorough cleaning and a check-up. However, when you have braces fitted, your dentist will probably want you to visit more often than this. As braces change the way in which you clean your teeth and can make it harder for you to clean them as thoroughly as you could before you had your braces fitted, it’s important to make regular visits to your dentist. They will be able to clean the hard to reach places behind your braces, and ensure that you’re looking after your braces in the right way. They will be able to advise you if you’re missing any areas when you’re cleaning your teeth yourself, and how to sort out these areas. They will be able to offer advice on the best thing in your personal circumstance to clean between your teeth, and they may suggest changing the method you’re using if they can see that you’re missing bits of plaque when you clean your teeth yourself. Your dentist will also be able to do a much deeper clean of your teeth than you are able to at home – your dentist has specialist tools that are the only things that can remove hardened plaque that’s set on your teeth. 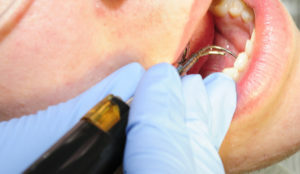 Deep, thorough cleanings like this will keep your teeth as healthy as possible and will also allow your dentist to ensure you have no other problems developing. Some dentists will remove your braces to clean your teeth, and other dentists won’t – this will depend on your dentist, the time you’ve had your braces on and the condition of your teeth. Even if you’re visiting your orthodontist regularly to get your braces checked, it’s important to keep going to your dentist too. No matter how frustrated you feel or how irritated you are when you first start to clean your teeth when you wear braces, you’ll soon get used to the tricks and methods that you can use to keep your teeth perfectly clean and healthy! After a couple of weeks of wearing braces and cleaning your teeth twice a day, you’ll soon be cleaning your teeth automatically and you won’t struggle with working around your braces. It’s even more important to regularly clean your teeth when you’re wearing braces, so it’s worth taking a little time at the beginning of your journey with braces to explore different teeth cleaning options. You’ll learn what works for you, and you’ll learn that your dentist and orthodontist can be hugely helpful and offer some great advice. Once you get into a routine of cleaning your teeth thoroughly each day, you will be able to feel the difference with your teeth and your gums. You will learn the spots where tiny bits of food tend to get stuck, and how best to reach them and stop them sticking. You’ll realise that having braces isn’t an inconvenience but a stepping stone to having a wonderful smile that you’ll be proud of for years to come. Great article! I’m so glad that it is normal for my teeth to feel like they are moving. I’ve been trying to brush so softly because I was worried about it. Also, brushing causes me a lot of pain, but I don’t want to get cavities or tooth decay. What should I do for the pain? Yeah i think it would freak anyone out if they noticed their teeth starting to move but it is completely normal when you have braces because thats how the teeth will straighten over time. If your brushing and it causes pain then it could be due to inflammed or swollen gums. Go see a dentist because it could also be caused by the braces.